Synopsis: Nobody has seen or heard from Superman in five years. In the meantime Lois Lane has become a mommy and she's written the Pulitzer-winning article "Why the World Doesn't Need Superman". But now Clark is back from what is left of Krypton and he's needed right now again: Lex Luthor has stolen Kryptionian crystals from the Fortress and wants to build a new continent - at the expense of that small island called North America. My Opinion: It took me some time to really get used to that movie. Mainly because I was mad at Bryan Singer for abandoning the X-Men project which resulted in The Last Stand. But now with a few years distance, I like this movie. Some elements are still very comic-like, like Lex's behaviour at some points of the story but that is fully outweighed by the moments he's truly evil. 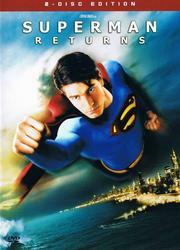 I also like Brandon Routh's portrayal of Clark/Superman. While Christopher Reeve's Clark was a bit of a douchebag that I didn't like very much, they chose to do it differently here. He's just a nobody who lingers in the background and isn't noticed by anybody but Jimmy. Lois couldn't care less about him in any way - which makes it believable that she doesn't see Superman in him. For me that works. Nice to see some love for this movie. While Christopher Reeve's Clark was a bit of a douchebag that I didn't like very much, they chose to do it differently here. That may be so but I wasn't raised with Superman comics - or any "western" comic for that matter. And I was really introduced to the Superman character through Dean Cain and later Tom Welling. And both portray him as a normal man (who has something to hide) and not as a whimp. And I like that better. I agree with Karsten. Although I also enjoy Christopher Reeve's performance of Clark Kent, I always liked the Lois & Clark approach much better. To cite Dean Cain's Clark: "Superman is what I can do, Clark is who I am." We have discussed this before, but the comics and films take the opposite angle. Superman is like a demi-God and so takes the disguise of Clark Kent to fit in with mere humans. That's a popular thing in various myths and stories too, that the Gods have human forms. Come to think of it, they're often idiots that everyone else disregards as well. While I do prefer this version, it's good that it can be treated so differently. I think the comics chop and change regularly anyway. Synopsis: Officer James Edwards is a normal NYPD cop until he meets a guy who has two pair of eyelids (one of them are gills) and when he learns that the guy who fences stolen watches also fences alien weapons. After he passed a test, James Edwards ceases to exist. 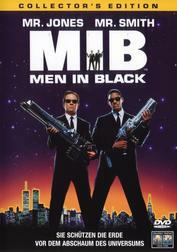 He becomes J, a Man in Black, working for the most secret organization on the face of this planet. And his very first mission is to help give birth to a squid. Ah yes, and his second mission is to save the Earth. My Opinion: Remember the times when 90 minutes for a movie were standard? Now it feels short. The advantage is that it has no lengths; there is not one point where this movie is boring. It is packed with jokes and gags regarding alien visitors and Tommy Lee and Will make a great team because they are so different. I also loved Linda as the coroner. I only know her from two movies (this and Dogma) and I'd love to see her in more. In both movies she has this nice dry sense of humour. Synopsis: Cameron has a strong crush on Bianca but he's not the only contender for her attention. His opponent Joey is not only a model but also financially well equipped. To make matters worse Bianca is only allowed to go on a date if her older sister Kat has one, too. And Kat has no intentions to date in the near future and she's also not the most uncomplicated person. Cameron needs to find someone who isn't afraid of the challenge and that's were Patrick Verona comes into play. My Opinion: It's a nice, modern day adaption of Shakespeare's The Taming of the Shrew and Heath (RIP) and Julia make a great couple. They have to because even though this is a movie about a triangle and a couple only the couple really works. Especially Cameron and Bianca pale in comparison, Cameron even more so than Bianca who has at least a few good scenes with her sister and the Prom scene. But it's still very watchable and has a cool soundtrack. 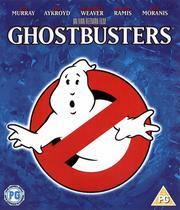 Synopsis: Peter, Ray and Egon are scientists in the widest sense of the word. They studied psychology and parapsychology and their experiments are on the fringe of actual science. Their life changes drastically when the university fires them and the Sumerian God called Gozer tries to enter this world via Dana Barrett's fridge. My Opinion: It's still a very funny movie and I still enjoy all the physical jokes in it, e.g. when they get slimed on or when they destroy a ball room with their proton packs or when Ray thinks of the Stay Puft Marshmallow Man. But I have to say that I was a bit disappointed by the quality of the Blu-ray. Especially in front of dark backgrounds you can see a lot of grain. They either didn't clean up the picture at all or they didn't do a very good job at it. Synopsis: WALL·E (Waste Allocation Load Lifter - Earth Class) is a robot that presses trash into cubes and piles them. It - he - has done it for the last 700 years and seems to be the only functioning robot left on Earth. The Humans left even more than 700 years ago. But then a search drone called EVE (Extraterrestrial Vegetation Evaluator) lands there to check if Earth has became inhabitable again. It - she - finds proof for that and returns to the last Humans out in space. 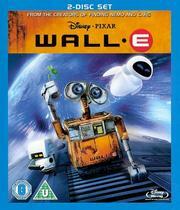 And WALL·E, having fallen in love with her, begins his biggest adventure and follows her. My Opinion: E.T. meets Number 5. The big eye trick always works. It's fascinating how this movie manages to communicate so much without having the characters to say anything. I also love all these "product placement" jokes that aren't in-your-face. Like when WALL·E has recharged, he makes the same sound a Mac does when it's booted up. Or EVE looking like a modern day Apple product. But I also loved "Also sprach Zarathustra" (2001) or AUTO (HAL 9000 anyone?). Then I watched the bonus material and laughed again about the short movie BURN·E and the way it interwove with WALL·E. 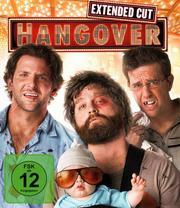 Synopsis: Doug is about to marry and he, his friends and his wife's brother want to enjoy their bachelor party in Vegas. Only that they can't remember any of it the day after. And even worse: Doug has disappeared. But instead they have a tiger, a baby, a police car and a lot of trouble. What the hell is going on here? My Opinion: The viewer is as puzzled as these three guys. The movie is a single row of WTF?! moments (especially when you see it for the first time) and the characters are all very "eccentric" on their own, especially Alan (the bride's brother). I had a lot of fun watching it again. Synopsis: After the entire Royal Family has been wiped out, England needs a new king and they find him - in America. Ralph is not what one would call born to be a representative of a nation but he has to do since there's no one else - or is there? The parliament could decide to end the Windham line and re-establish the Stuarts as the royal line again. And Lord Graves - the next in line - does everything in his might to make this happen. My Opinion: After watching so many Doctor Who episodes I wanted to watch the movie where I saw Jackie Tyler (Camille Coduri) for the first time again. It's not that good a movie but I still enjoy it very much mainly because it's true what Cedric says in the end: Ralph is a good and decent man and he does what is right. This movie has many funny scenes and still manages to not really mock the British monarchy. 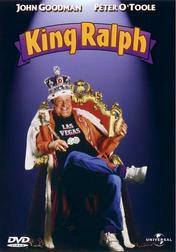 I always enjoyed King Ralph myself. Not a great movie... but definitely entertaining. I haven't watched it in a while though. Karsten, are you trying to be an honourary Brit or something? Watching Doctor Who and can probably recite Rule Britannia too! Brilliant. Synopsis: Normandy, June, 1944. 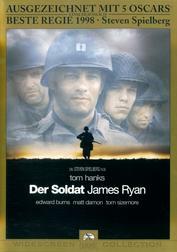 Captain Miller and his men have just survived the landing of the allied forces in France when they get another mission: To find Private Ryan who is with the 101st Airborne and has landed somewhere in the middle of the ongoing battles. Private Ryan has lost his three brothers in this war and it was decided that at least one of the Ryan brothers should return home alive. But he is not an easy man to find. My Opinion: A very impressive movie. What makes this movie watch-worthy for me are not the big battle scenes. Those I watch with a rather analytical eye and am somewhat disconnected. What gets to me are the scenes in between, when they just sit somewhere and talk, or when Miller silently cries after the fight at the radar station, or in the end when Ryan asks if he has been a good person. I haven't seen this movie in quite some time (It's not a movie one puts in lightly) and I noticed how many faces have become familiar since then: Giovanni Ribisi, Vin Diesel, Nathan Fillion (I had to look twice to recognise him!) and even Jeremy Davies (Daniel Faraday in LOST) - that last one I didn't even recognise, he just looked familiar until I looked him up.